An Early Head Start Teacher is responsible for assisting the Head Start Teacher in the planning and implementation of the education system. 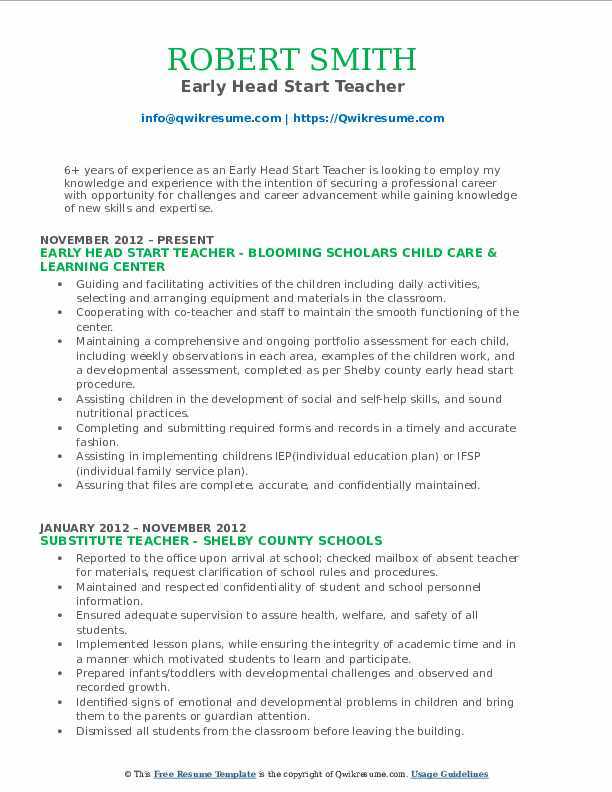 A conventional Early Head Start Teacher Resume contains roles and responsibilities, like initiating daily schedule, planning new educational projects, developing those lesson plans, ensuring the safety of the children, help children with their meals as well as overall behavior, etc. Some of the important qualifications needed to apply for this challenging role are: a flair for being around children, strong educational background, excellent knowledge in the current educational trends, basic computer knowledge, having the ability to implement new teaching methodologies and a knack for being patient yet firm. Minimum education required for this role is a Bachelor’s Degree in Arts, Science, or Management. A Master’s Degree and relevant work experience are considered as added advantages. 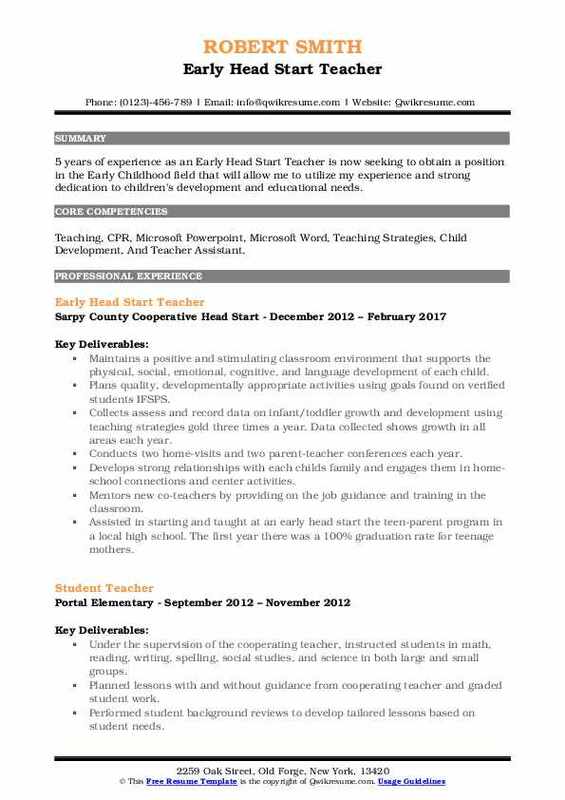 Objective : 4 years of experience as an Early Head Start Teacher is now seeking to obtain a position that will utilize my skills, abilities, education, and experience. Skills : Microsoft Office, Customer Service, Food Service, Crew Member, Housekeeping, Childcare, And Packaging. Detect and report signs of illness, discomfort and unusual behavior of children to family advocates, and specialist. Mandated reporting of suspected child abuse/neglect to the department of children family services. Develop and utilize integrated curriculum plans, which reflect mandated elements and components, parental and cultural influences, and promote the social, emotional, physical and cognitive development of early head start children. Follow a consistent schedule, which includes small and large group experiences, choice time, music and movement, large and small motor activities, skill development, meals, and effective transitions between activities. Provide the necessary interaction and environment that facilitates maximum child development and involvement. Prepare classroom materials to support developmentally appropriate curriculum plans; create and change learning centers as needed. Provide an atmosphere that promotes and reinforces parental engagement. Modeling appropriate behavior and positive guidance techniques. Communicate regularly with parents, regarding each child’s progress. Conduct the required parent/teacher conferences and home visits for the purpose of assessment and support. And to share information on classroom progress and educational strategies at school and home. Work with appropriate agencies in developing specialized planning for children and families as needed. Utilize information systems to support child (school readiness), family and agency outcomes. 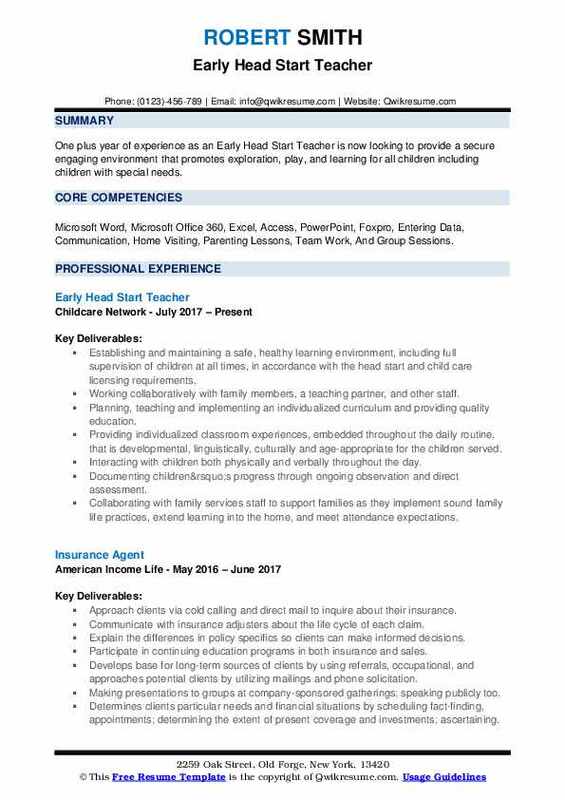 Objective : One plus year of experience as an Early Head Start Teacher is now looking to provide a secure engaging environment that promotes exploration, play, and learning for all children including children with special needs. Skills : Microsoft Word, Microsoft Office 360, Excel, Access, PowerPoint, Foxpro, Entering Data, Communication, Home Visiting, Parenting Lessons, Team Work, And Group Sessions. Establishing and maintaining a safe, healthy learning environment, including full supervision of children at all times, in accordance with the head start and child care licensing requirements. Working collaboratively with family members, a teaching partner, and other staff. Planning, teaching and implementing an individualized curriculum and providing quality education. Providing individualized classroom experiences, embedded throughout the daily routine, that is developmental, linguistically, culturally and age-appropriate for the children served. Interacting with children both physically and verbally throughout the day. Documenting children’s progress through ongoing observation and direct assessment. Collaborating with family services staff to support families as they implement sound family life practices, extend learning into the home, and meet attendance expectations. Assisting children with their personal hygiene and clean up the of the classroom. Familiarity with GA state licensing requirements and childcare network policies. 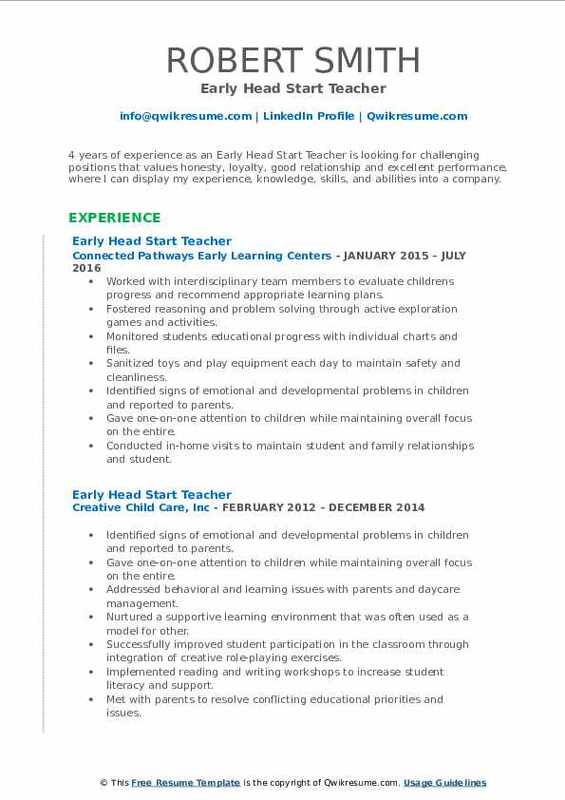 Summary : 11 years of experience as an early Head Start Teacher. Highly motivated and known for an ability to increase effectiveness through dedication, hard work and time management skills. Seeking full-time employment with an organization to gain experience and more knowledge for future endeavors. Skills : Proficient In All Microsoft Office Products Including Outlook, Microsoft Word, PowerPoint, Excel, And WordPerfect Excellent Communication, Excellent Work Ethic, And Reliability Great People. Observe and record behaviors of children to assist the EHS home visitor and/or teacher in the identification of each child's strengths and areas to grow. Develop and utilize daily plans which reflect mandated elements, parental and cultural. Influences, and promote the social, emotional, physical, and cognitive development of the child. Follow a consistent schedule that meets individual needs, including small and large group experiences, choice time, music and movement, large and small motor activities. Encourage experimentation, exploration, problem solving, cooperation, socialization, and choice making. Assist home visitors and teachers in maintaining accurate written/electronic records including assessments, IFSP documentation, screening instruments, anecdotal. Attend meetings, training, and appropriate professional development activities. 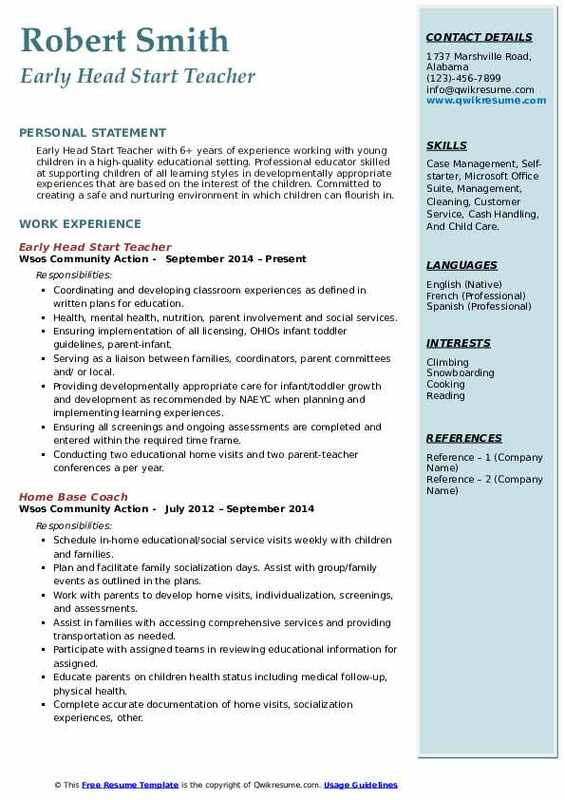 Objective : 4 years of experience as an Early Head Start Teacher is looking for challenging positions that values honesty, loyalty, good relationship and excellent performance, where I can display my experience, knowledge, skills, and abilities into a company. Skills : CPR, CPR Certified, Time Management, Microsoft Office Suite, Management, Cleaning, Customer Service, Cash Handling, And Child Care. Monitored students educational progress with individual charts and files. Gave one-on-one attention to children while maintaining overall focus on the entire. Conducted in-home visits to maintain student and family relationships and student. Nurtured a supportive learning environment that was often used as a model for other. Headline : Early Head Start Teacher with 6+ years of experience working with young children in a high-quality educational setting. Professional educator skilled at supporting children of all learning styles in developmentally appropriate experiences that are based on the interest of the children. Committed to creating a safe and nurturing environment in which children can flourish in. Skills : Case Management, Self-starter, Microsoft Office Suite, Management, Cleaning, Customer Service, Cash Handling, And Child Care. Coordinating and developing classroom experiences as defined in written plans for education. Health, mental health, nutrition, parent involvement and social services. Ensuring implementation of all licensing, OHIOs infant toddler guidelines, parent-infant. Serving as a liaison between families, coordinators, parent committees and/ or local. Providing developmentally appropriate care for infant/toddler growth and development as recommended by NAEYC when planning and implementing learning experiences. Ensuring all screenings and ongoing assessments are completed and entered within the required time frame. Conducting two educational home visits and two parent-teacher conferences a per year. Maintaining effective communication with parents regarding child development. Direct and train teacher assistants, substitutes, center aid and volunteers working in the classroom. Maintaining certification and credentials including child care licensing and professional. Developing and implementing systems to monitor daily communication, experiences, tracking and scheduling. Headline : 6 years of experience as an Early Head Start Teacher is seeking a position that involves teamwork and helping others while positively impacting the lives of children. Skills : Child Development, Early Childhood, Curriculum Development, Infant Toddler, Microsoft Office Suite, And Management. Provides and maintains appropriate welcoming environment and atmosphere where children are accepted and respected as individuals. Plans and implements daily plans that are developmentally appropriate for the group and individual with input from parents; communicates positively with infants and toddlers; uses appropriate child development methods; adapts activities for special needs toddlers. Visits infants and toddlers families two to five times per year depending on the needs of the family; assists families and maintains open communications; encourages parent involvement; respects culture and background of families; acts as a positive role model for parents, infants, and toddlers. Demonstrates compliance with head start program performance standards and Arizona DHS licensing requirements. Demonstrates an understanding of infants/toddler growth development and applies this knowledge to practice. Records and reports the necessary data to track and monitor toddlers developmental progress. Works cooperatively with parents and identifies resources to coordinate goals and activities that meet the plans set for children with special needs. Plans for and supports the development of individual goals/objectives of infants/toddlers that take into consideration their family culture and background. 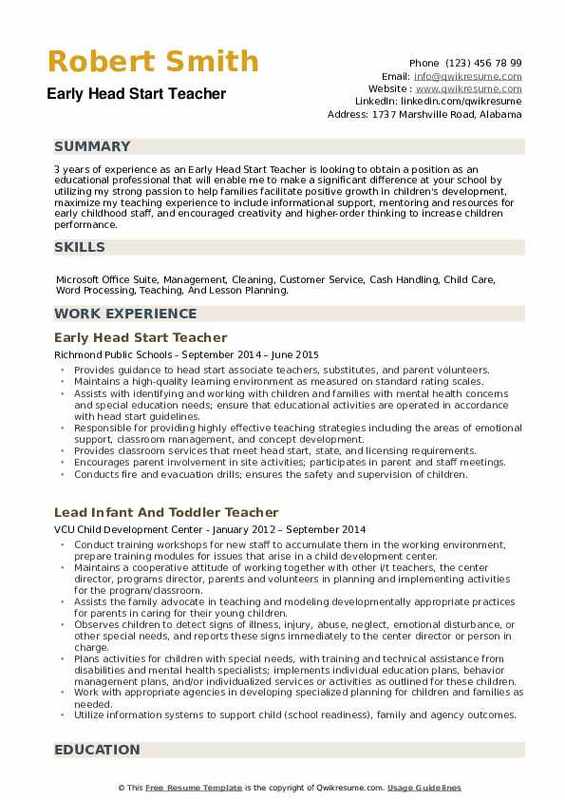 Headline : 6+ years of experience as an Early Head Start Teacher is looking to employ my knowledge and experience with the intention of securing a professional career with opportunity for challenges and career advancement while gaining knowledge of new skills and expertise. Skills : Microsoft Office, Foxpro, Entering Data, Communication, Home Visiting, Parenting Lessons, Team Work, Group Sessions. 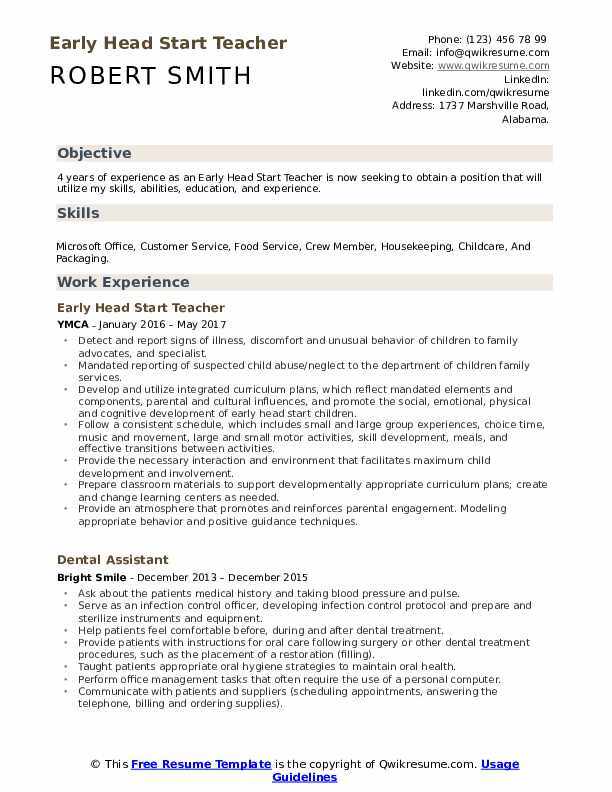 , Teacher Assistant, Child Development, And Early Childhood. Guiding and facilitating activities of the children including daily activities, selecting and arranging equipment and materials in the classroom. Cooperating with co-teacher and staff to maintain the smooth functioning of the center. Maintaining a comprehensive and ongoing portfolio assessment for each child, including weekly observations in each area, examples of the children work, and a developmental assessment, completed as per Shelby county early head start procedure. Assisting children in the development of social and self-help skills, and sound nutritional practices. Completing and submitting required forms and records in a timely and accurate fashion. Assisting in implementing children's IEP(individual education plan) or IFSP (individual family service plan). Assuring that files are complete, accurate, and confidentially maintained. Actively participate in the development and implementation of the teacher professional development plan. Conducting parent/teacher conferences and home visits to discuss the child's individual development and progress, assist the parents in developing observational skills and solicit parent observations. 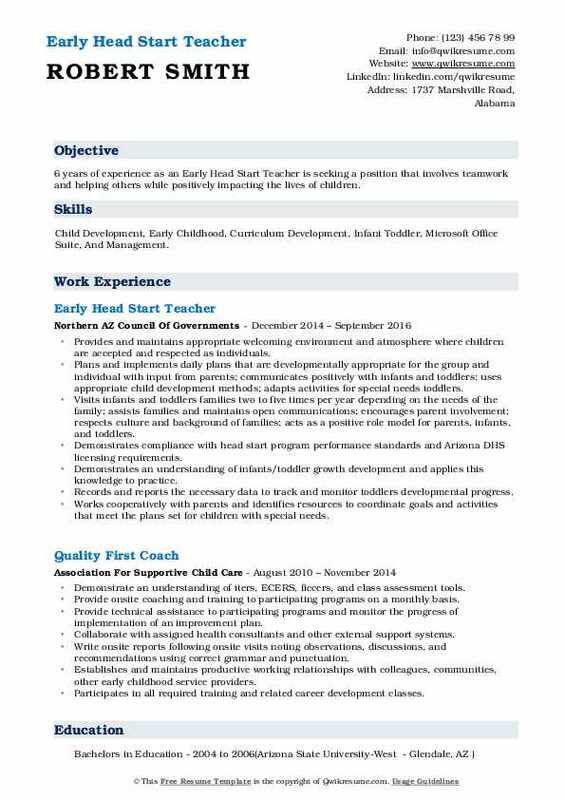 Objective : 5 years of experience as an Early Head Start Teacher is now seeking to obtain a position in the Early Childhood field that will allow me to utilize my experience and strong dedication to children's development and educational needs. Skills : Teaching, CPR, Microsoft Powerpoint, Microsoft Word, Teaching Strategies, Child Development, And Teacher Assistant. Maintains a positive and stimulating classroom environment that supports the physical, social, emotional, cognitive, and language development of each child. Plans quality, developmentally appropriate activities using goals found on verified students IFSPS. Collects assess and record data on infant/toddler growth and development using teaching strategies gold three times a year. Data collected shows growth in all areas each year. Conducts two home-visits and two parent-teacher conferences each year. Develops strong relationships with each child's family and engages them in home-school connections and center activities. Mentors new co-teachers by providing on the job guidance and training in the classroom. Assisted in starting and taught at an early head start the teen-parent program in a local high school. The first year there was a 100% graduation rate for teenage mothers. Objective : 3+ years of experience as an Early Head Start Teacher is looking to serve, lead, teach, mentor, disciple students at an educational facility - as well as to assist a teacher and reinforce the instruction taught in the classroom to students. This can include going over lessons with students individually, answering questions or grading assignments. 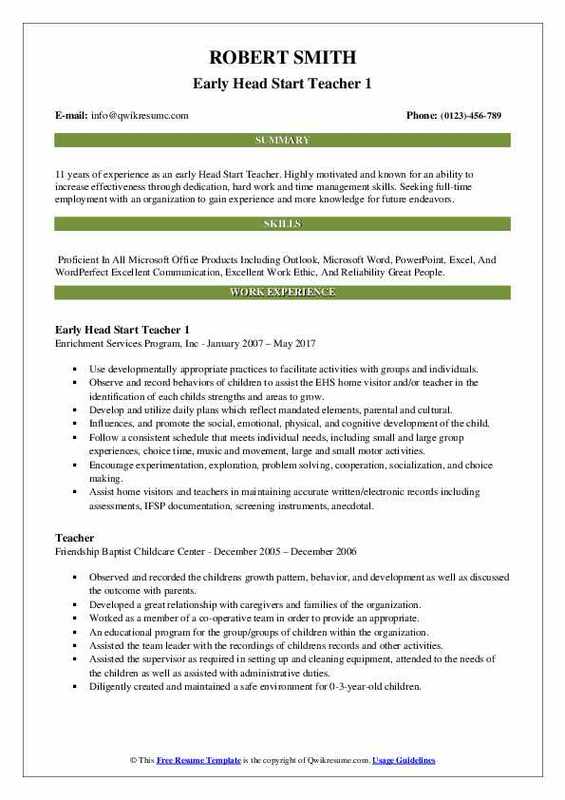 Skills : Customer Service, Front Desk, Typing, Team Leader, Retail Sales, Teaching, Word Processing, Microsoft Office, Teaching, And Lesson Planning. Providing a variety of materials and resources for children to explore, manipulate and use, both in learning activities and in imaginative play. Attending to children basic needs by feeding them, dressing them, and changing their diapers. Teaching basic skills such as color, shape, number and letter recognition, personal hygiene, and social skills. Establishing and enforcing rules or behavior, and procedures for maintaining order. Organizing and leading activities designed to promote physical, mental and social development, such as games, arts and crafts, music, storytelling, and field trips. Observing and evaluating children performance, behavior, social development, and physical health. Identifying children showing signs of emotional, developmental, or health-related problems, and discuss them with supervisors, parents or guardians, and child development specialists. Meeting with parents and guardians to discuss their children progress and needs, determine their priorities for their children, and suggest ways that they can promote learning and development. Objective : 3 years of experience as an Early Head Start Teacher is looking to obtain a position as an educational professional that will enable me to make a significant difference at your school by utilizing my strong passion to help families facilitate positive growth in children's development, maximize my teaching experience to include informational support, mentoring and resources for early childhood staff, and encouraged creativity and higher-order thinking to increase children performance. 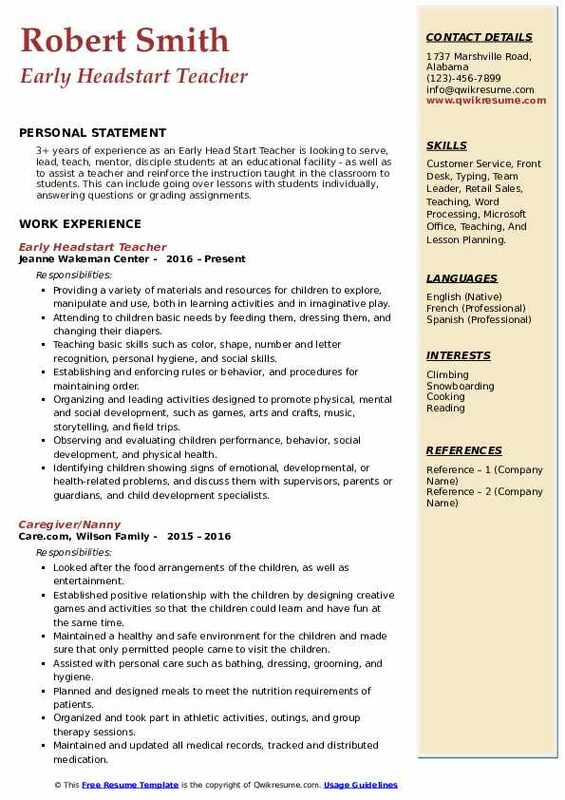 Skills : Microsoft Office Suite, Management, Cleaning, Customer Service, Cash Handling, Child Care, Word Processing, Teaching, And Lesson Planning. Provides guidance to head start associate teachers, substitutes, and parent volunteers. Maintains a high-quality learning environment as measured on standard rating scales. Assists with identifying and working with children and families with mental health concerns and special education needs; ensure that educational activities are operated in accordance with head start guidelines. Responsible for providing highly effective teaching strategies including the areas of emotional support, classroom management, and concept development. Provides classroom services that meet head start, state, and licensing requirements. Encourages parent involvement in site activities; participates in parent and staff meetings. Conducts fire and evacuation drills; ensures the safety and supervision of children.